714 p., 14,7 x 20,5 cm. With contributions by Oliviero Angeli, Alexia Autenne, Luca Baccelli, Matthew Bagot, Endre Begby, Thorsten Benner, Chiara Bottici, J. Peter Burgess, Jean-Yves de Cara, Mathieu Cardon, Paul Cobben, Philippe Coppens, Herman van Erp, Isabelle Ferreras, Claude Foucart, Barbara Freitag-Rouanet, Micheline Egge Grung, Jérome Guichard, Christian Hamm, Austin Harrington, Christian Hiebaum, Otfried Höffe, Ralf J. Leiteritz, Hans Lindahl, Daniel Loewe, Roland von Loosbroek, Stefano Mannoni, Jean-Christophe Merle, Andreas Nölke, Alessandro Pinzani, Thomas Pogge, Gregory Reichberg, Wolfgang Reinicke, Alain-Marc Rieu, Valérie Rosoux, Alessio Scandurra, Debora Spini, Henrik Syse, László Trócsányi and Jan Martin Witte. In the current debate about globalization, its supporters praise its benefits for the economy and for peace while its opponents express their skepticism about its serious consequences for solidarity and democracy in our societies. Yet, the decisive point is already the path towards a global world order as well as the justification of this way. How can globalization of political institutions be conceived of, if it is to comply with the principle of democracy and the rule of law? 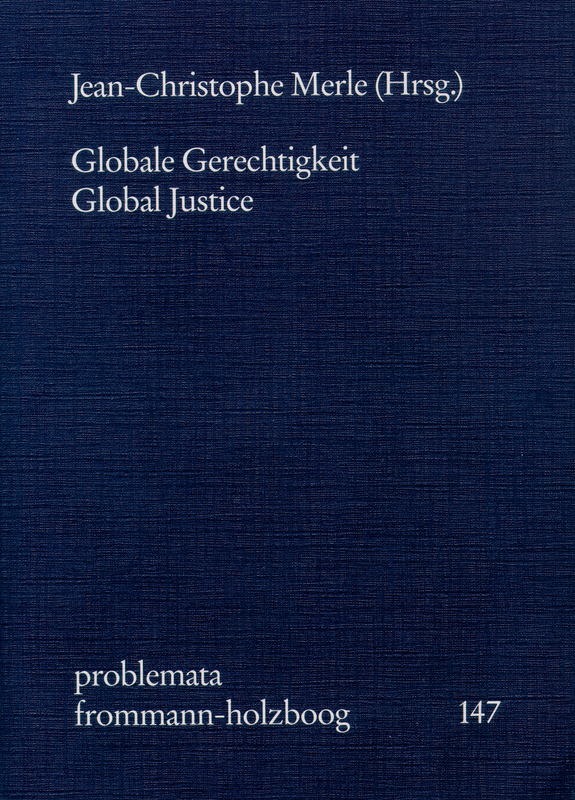 This volume addresses three central dimensions of this problem: (i) the ethics of international negotiations and agreements; (ii) the question whether global public debate and deliberation might gradually arise; (iii) the issue of the way in which the principles of federalism and subsidiarity could be applied to global political institutions. 2.1. Die Entstehung einer globalen Öffentlichkeit? Alessandro Pinzani: Strukturwandel der Weltöffentlichkeit? Christian Hiebaum: From Sovereignty to Subsidiarity. Can and Should There Be a Complete Shift in Paradigm? Jean-Christophe Merle: Föderalismus als lokale Kompetenz oder als Repräsentation in der nationalen Selbstgesetzgebung? Herman van Erp: The European Union. A Step Towards a World Republic? Roland van Loosbroek: Federalism. Social Contract or Actualization of Freedom? Entsprechend sei der Band (neben der allgemeinen Relevanz des Themas) vor allem denen empfohlen, die am Begriff der (globalen) Öffentlichkeit sowie an den Begriffen Föderalismus, Souveränität und Subsidiarität interessiert sind. Für sie finden sich Dutzende Beiträge von Wissenschaftlern aus ganz Europa.